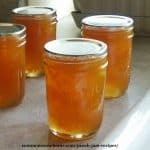 I adapted the peach vanilla jam recipe from Grow It, Cook It, Can It. It's on the right in the photo below. If you look closely, you can see the flecks of vanilla bean. This one is the boys' favorite – probably because it's a bit sweeter. It tastes good when it's fresh, but tastes phenomenal once it's had a chance to age. Note: These peach jam recipes use calcium water. The calcium water is made from calcium powder that is included in the boxes of Pomona's Universal Pectin. One box of Pomona's will make several batches of jam/jelly, and it has a shelf life of several years unopened. Last year I bought a case of the pectin and split it with friends. You could use other low/no sugar pectins as well. Just omit the calcium water and follow their cooking instructions. 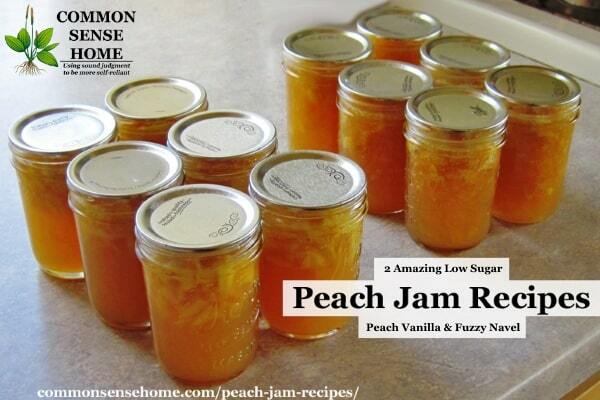 Turn your ripe, juicy peaches into an awesome low sugar jam with just a hint of vanilla. Sterilize seven 8-ounce jars, keep hot. Prep lids and rings. Fill water bath canner and bring to boil. In a small bowl, mix together sugar and pectin powder. Don’t skip this step, or your pectin will clump. Set aside. 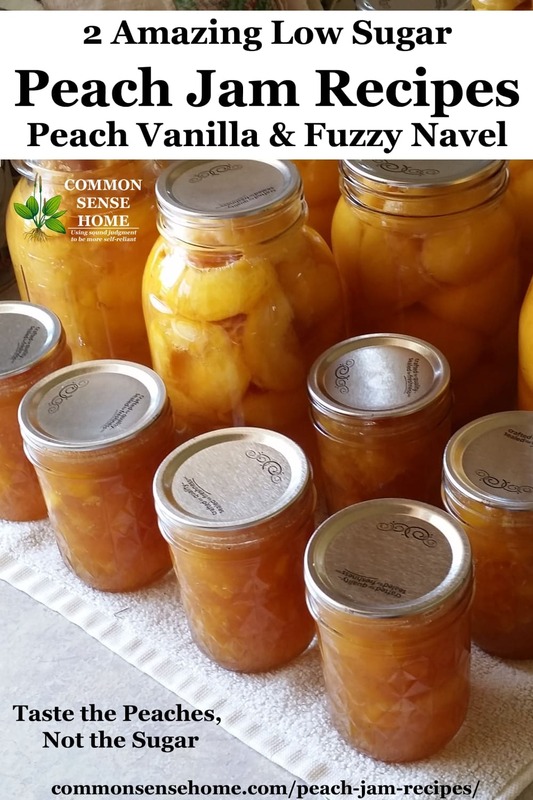 In a large, non-reactive pot, combine peaches, lemon juice, vanilla bean and the calcium water. Bring to a full boil. Ladle peach jam into sterilized jars leaving 1/4″ headspace. Wipe rims clean and screw on the lids. Process for 10 minutes in water bath canner (add 1 minute for every 1,000 feet above sea level). Jam will last about three weeks once opened. Makes around 6-7 cups. Sugar may be reduced to 2 cups if preferred. 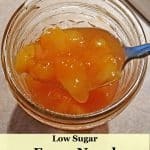 I found a fuzzy navel peach jam recipe, but it used peach schnapps, which I didn't have in the house, and more sugar than I wanted, so I used the guidelines on the package insert of Pomona's Pectin and made a recipe up. 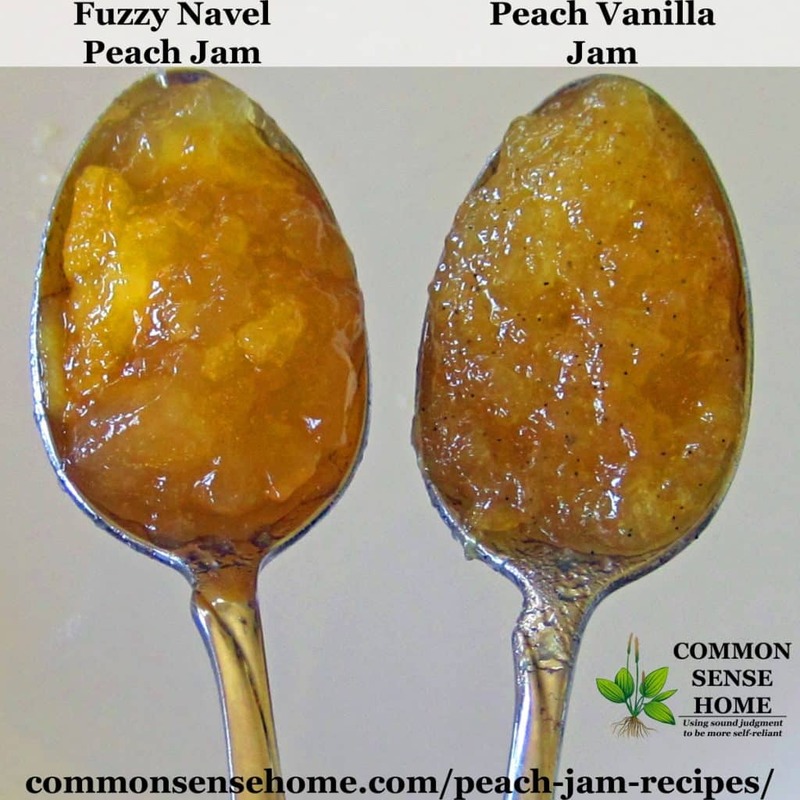 The fuzzy navel jam is on the left in the photo below. 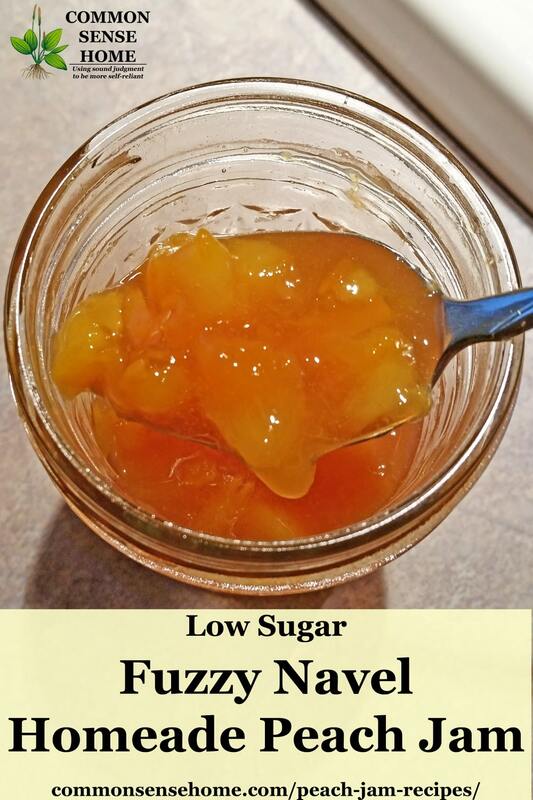 Peaches and oranges pair up in a delicious low sugar homemade peach jam recipe. Sterilize seven 8-ounce jars, keep hot. Prepare lids and rings. Fill water bath canner and bring to boil. In a large, non-reactive pot, combine peaches, orange juice, lemon juice and the calcium water. Bring to a full boil. Wash and rinse air tight 8 ounce containers. Peel and chop peaches. Add juice. Bring to boil in pain and boil two minutes, stirring constantly. Turn off heat and cool. Measure sugar or sugar substitute and set aside. Bring 3/4 cup of water to a boil. Put water in a blender or food processor. Add pectin powder, open lid vent and blend 1-2 minutes until all powder is dissolved. Add hot pectin/water mix to fruit mix. Stir until well blended. Add calcium water and stir well. Mixture should start to jell. If jelling does not occur, add one teaspoon of calcium water at a time until jelling occurs. Jam may be softer than cooked jam. Fill containers to 1/2″ from top. Cover and store in freezer immediately or keep in refrigerator for up to one week. Store thawed peach jam in refrigerator. I hope you get a chance to enjoy some peaches this year, and maybe put some away to enjoy this winter, too. If you've enjoyed this post, please pass it along. Originally posted in 2011, updated in 2017, 2018.
could I replace all or part of the sugar with splenda and/or stevia? I enjoy your site. While I don't recommend the use of Splenda, as it is an excitotoxin(http://suewidemark.com/splenda.htm), you could substitute stevia, or leave out the sweetener entirely, as Pomona's Pectin does not use the sugar as a jelling agent like regular pectins do. Keep in mind that this will reduce the shelf life of the product. The Natural Canning Resource Book explains why, and give examples of how to safely modify recipes for low and no sugar. 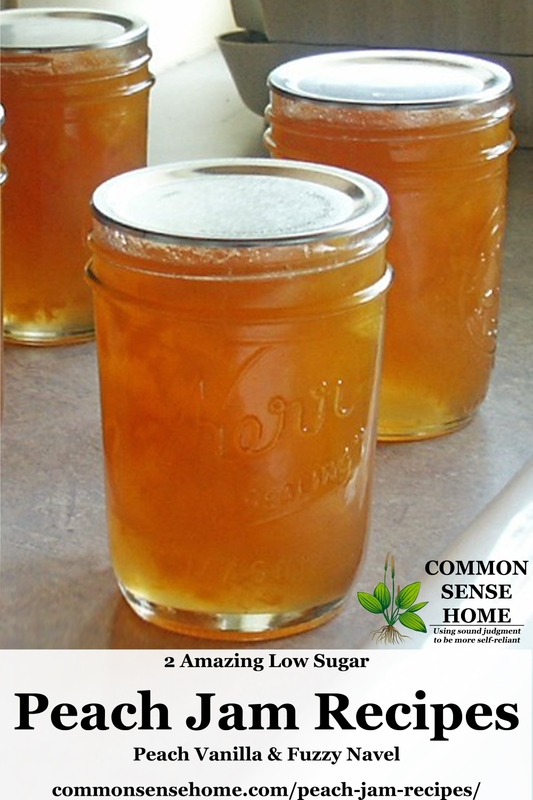 Sugar binds up water molecules in the jam, which helps to prevent spoilage. Always glad to visit you with all your wonderful ideas and recipes. Great learning tips too. Thanks, Debi! I'm always learning, too, so I like to share what I find out. Off topic but I wanted to let you know I linked your cornbread recipe in my post today on cornbread waffles. I didn't use your recipe to make them (I sort of experimented) but your cornbread was the best I have I ever made and I told folks so. Better than mine. I always enjoy your recipes and your refreshing outlook on life and family. Brigid – thanks so much for stopping by. I always enjoy visiting you and Barkley, too. I've never tried cornbread waffles, but they sound like excellent fall fare. Mmmm! I've never made peach jam, but your pictures tempt me to try. Looks good! I have never canned before, but am wanting to give it a go because the peaches and nectarines are phenomenal this year. I don't know the first thing about it. Where would you recommend I start educating myself on the topic? The Ball Blue Book is a very good and inexpensive reference to get started canning. I'm planning to write a post on canning peaches, but have been so busy canning I'm not sure when I'll have time! The Natural Canning Resource Book (https://commonsensehome.com/the-natural-canning-resource-book-book-review/) also give a TON of information on the "whys" and "hows" of canning, but not too many recipes. What is calcium water? First time I’ve run across it. It’s included in the Pomona’s Pectin. If you wanted to use a different low-sugar pectin, you could skip the calcium water and follow their jelling directions. I have used Pomona’s but I find I like agar much better. Can still reduce the sugar (I use half what Certo calls for – 4cups strawberries, 2 cups sugar) and I find it more convenient and less expensive. I haven’t used agar for jams. Does the cooking/processing change? What a great way to preserve summer peaches to have all year. I can’t wait to try it! Thanks for making the recipes printable and printable to one page only! Now they are easily added to my canning recipe collection.